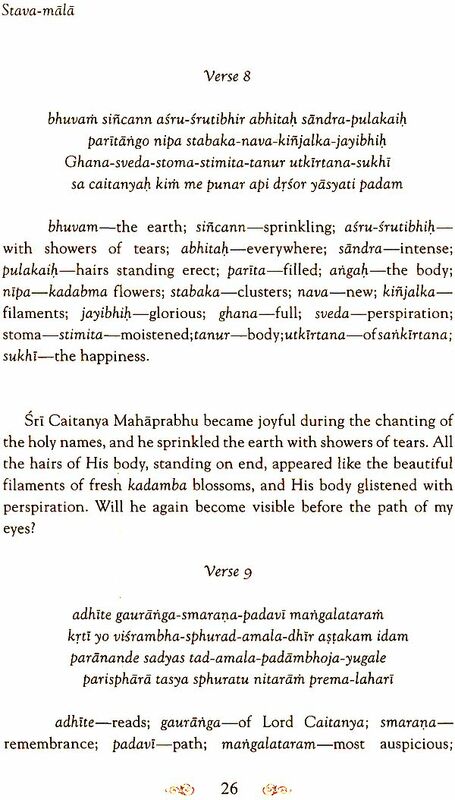 Written by the XVIth century saint and poet Srila Rupa Gosvami, the "Stava-mala" or "Garland devotional prayers", describes the glorious rapture of divine sentiments felt by Sri Caitanya Mahaprabhu, while He loudly chanted Lord Hari's Holy Name. 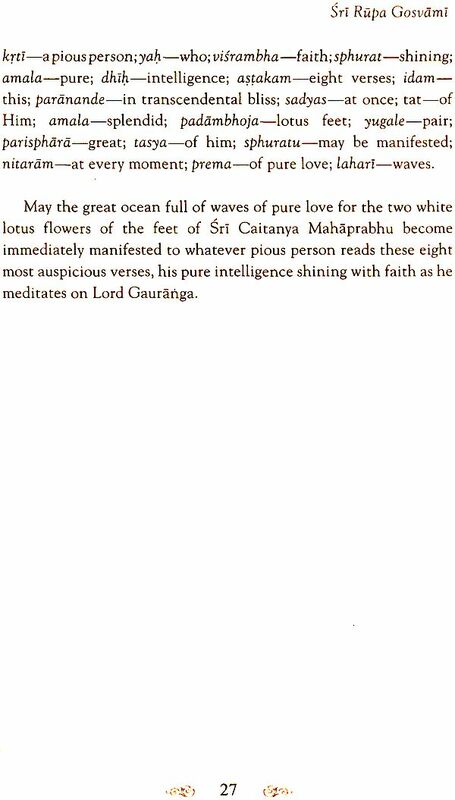 Through divine poetry, the Gosvami has blessed the world with the most sublime description of Sri Caitanya's heart. 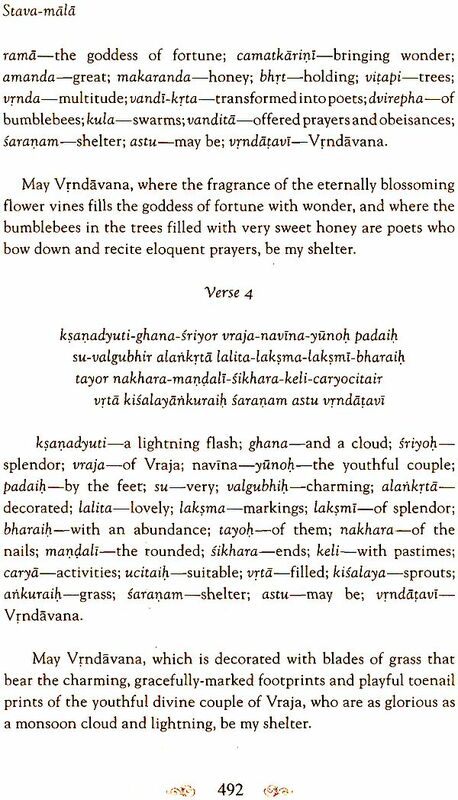 Ghana-sveda-stoma-stimita-tanur utkirtana-sukhi,br> Sa caitanyah kim me punar api drsor yasyati padam." Sri Caitanya Mahaprabhu became joyful during the chanting of the holy names, and he sprinkled the earth with showers of tears. 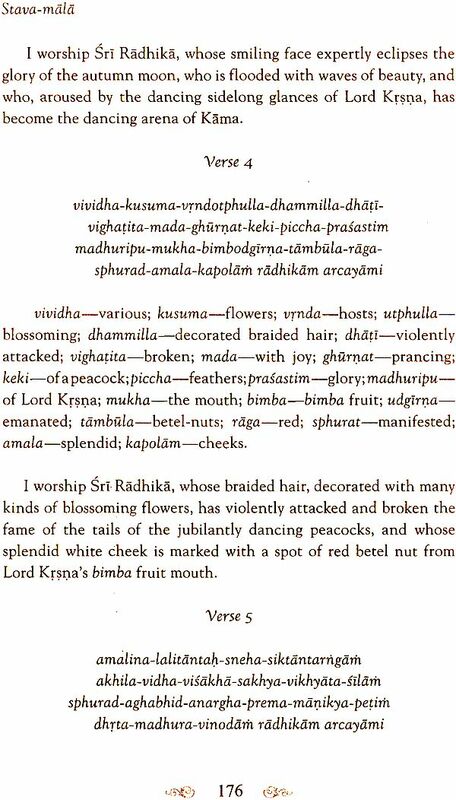 All the hairs of His body, standing on end, appeared like the beautiful filaments of fresh kadamba blossoms, and his body glistened with perspiration. Will he again become visible before the path of my eyes? 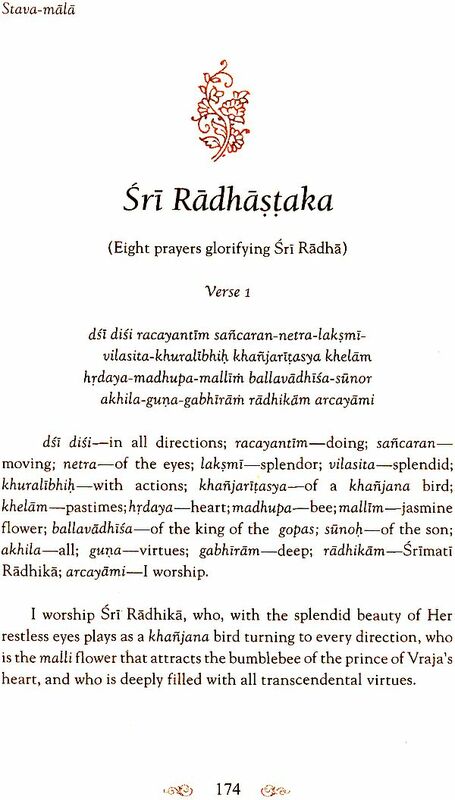 In a purport of Sri Caitanya-caritamrta, Srila Prabhupada wrote: In the Gaura-ganoddesa-dipika (180) Sri Rupa Gosvami is described to be the gopi named Sri Rupa manjari. 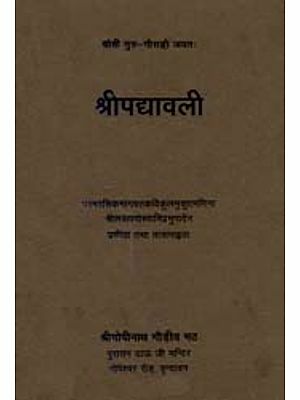 In the Bhakti-ratnakara there is a list of the books Sri Rupa Gosvami compiled. 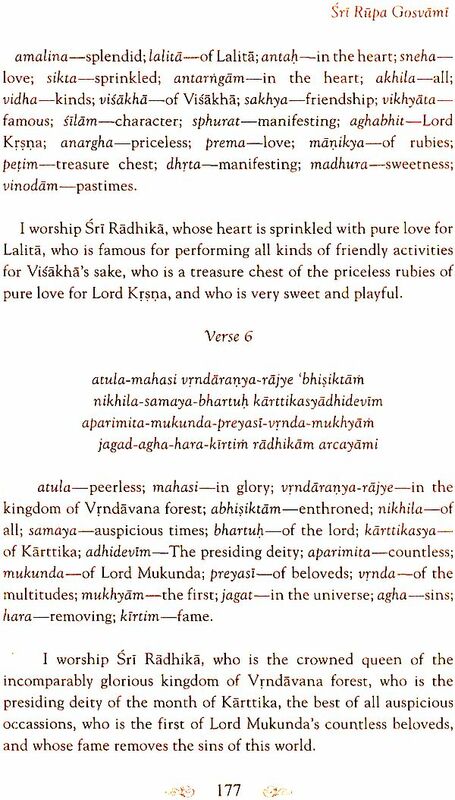 Of all his books, the following sixteen are very popular among Vaisnavas: (1) Hamsaduta, (2) Uddhava-sandesa, (3) Krsna-janma -tithi-vidhi (4 and 5) Radha-krsna-ganoddesa-dipika, Brhat (major) and Laghu (minor), (6) Stavamala, (7) Vidagdha-madhava, (8) Lalita-madhava, (9) Dana-keli-kaumudi, (10) Bhakti-rasamrta-sindhu (this is the most celebrated book by Sri Rupa Gosvami), (11) Ujjvala-nilamani, (12) Akhyata-candrika, (13) Mathura-mahima, (14) Padyavali, (15) Nataka-candrika and (16) Laghu-bhagavatamrta. 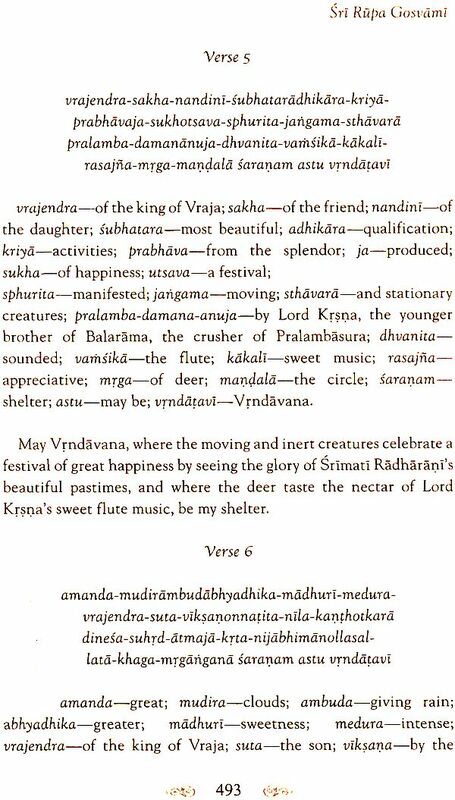 In his Sri Caitanya-caritamrta, the author, Srila Krsnadasa Kaviraja Gosvami, has mentioned many verses from the Stavamala. "We Gaudiya Vaisnavas are known as rupanuga." 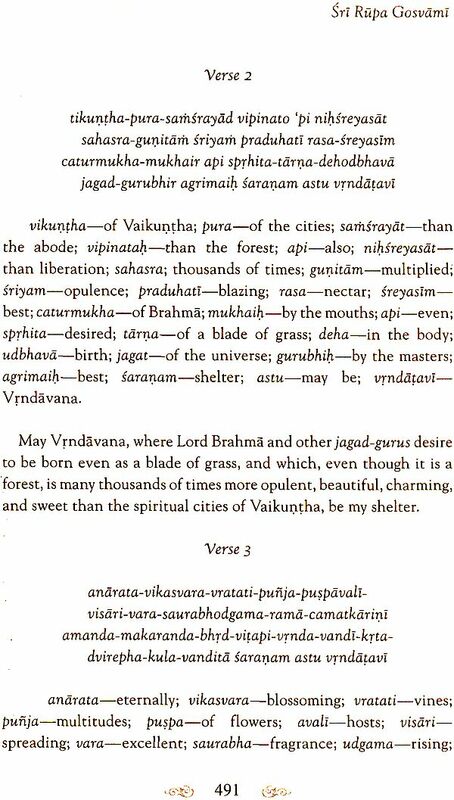 "Actually going to Vrndavana involves taking shelter of the six Gosvamis by reading the Bhakti-rasamrta-sindhu, Vidagdha-madhava, Lalita-madhava and the other books that they have given. 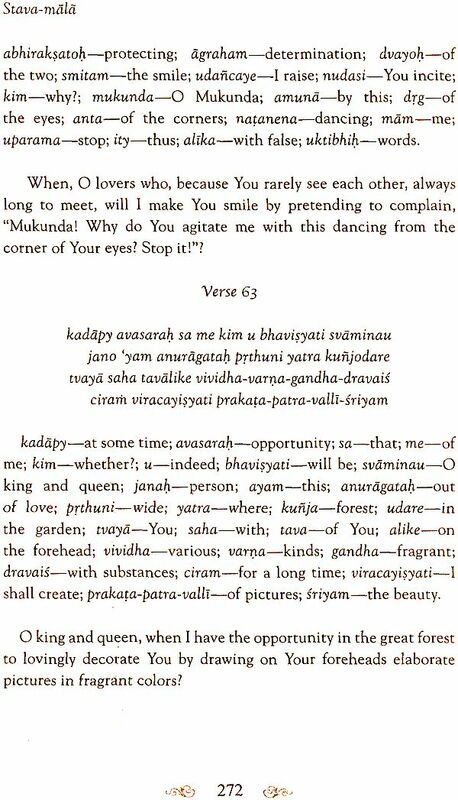 In this way one can understand the transcendental loving affairs between Radha and Krsna. Kabe hama bujhaba se yugala-piriti. 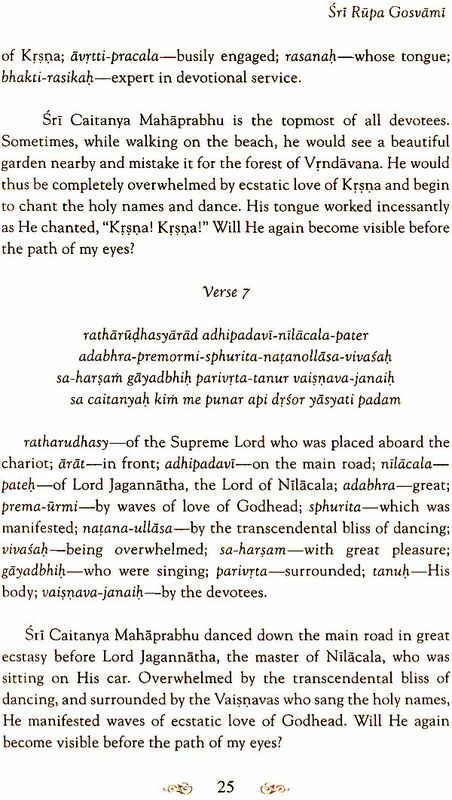 "I met Rupt Gosvami at Prayaga, and became very attracted to him because of his exalted qualities." 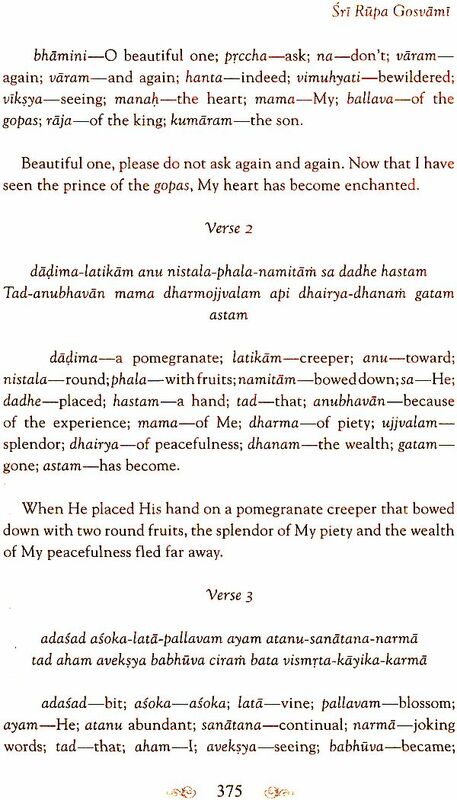 Thereafter, Shri Chaitanya Mahaprabhu praised Rupa Gosvami's use of metaphors and other literary ornaments, and said that without such poetic attributes there is no possibility of preaching transcendental mellows. 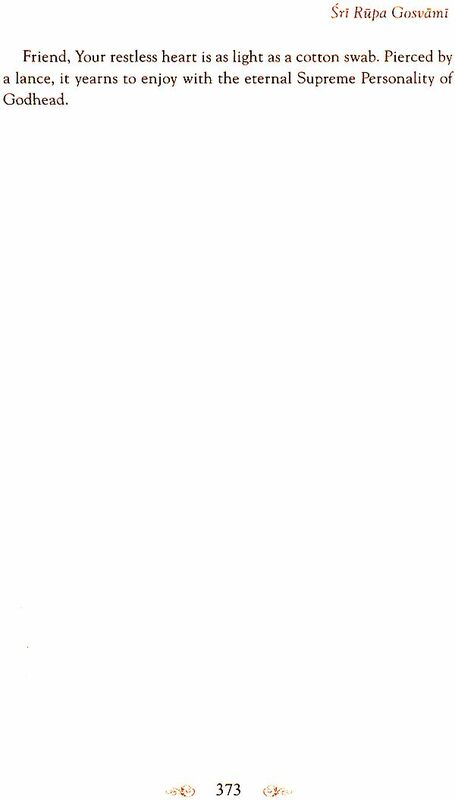 The Lord then requested all His personal associates of preaching transcendental mellows. 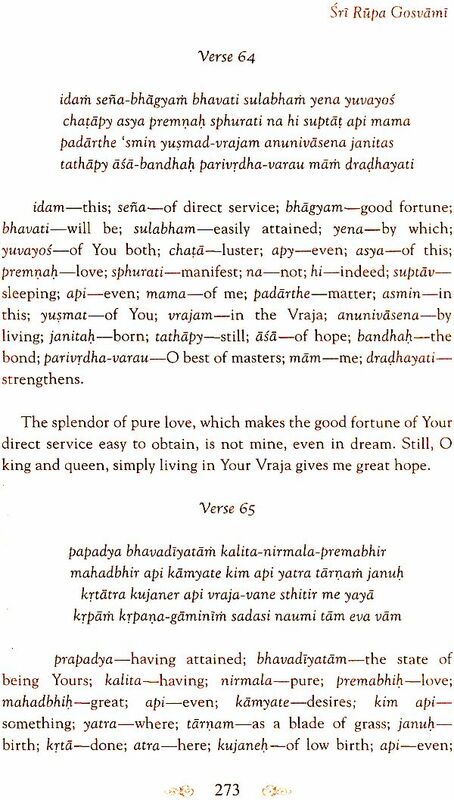 The Lord then requested all His personal associated to bless Rupa Gosvami so that he would be able to continuously describe the pastimes of Vrindavana, which are full of emotional love of Godhead. 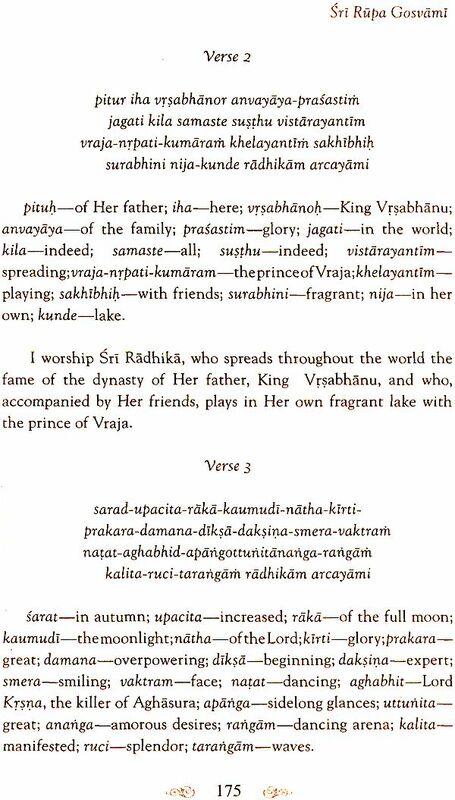 In a purport of Sri Caitanya-caritamrta, Srila Prabhupada wrote: In the Gaura-ganoddesa-dipika (180) Sri Rupa Gosvami is described to be the gopi named Sri Rupa manjari. 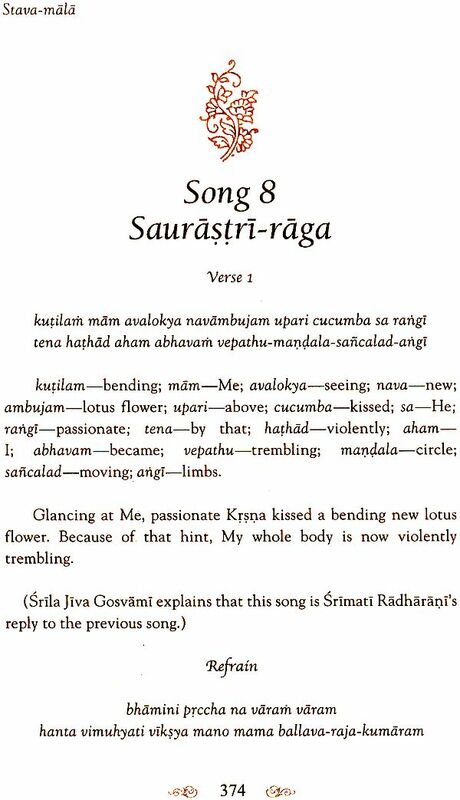 In the Bhakti-ratnakara there is a list of the books Sri Rupa Gosvami compiled. 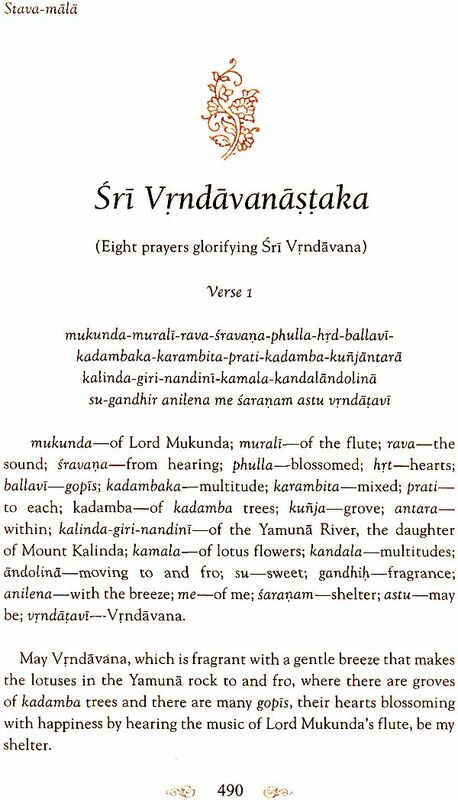 Of all his books, the following sixteen are very popular among Vaisnavas: (1) Hamsaduta, (2) Uddhava-sandesa, (3) Krsna-janma-tithi-vidhi, (4 and 5) Radha-krsna-ganoddesa-dipika, Brhat (major) and Laghu (minor), (6) Stavamala, (7) Vidagdha-madhava, (8) Lalita-madhava, (9) Dana-keli-kaumudi, (10)Bhakti-rasamrta-sindhu (this is the most celebrated book by Sri Rupa Gosvami), (11) Ujjvala-nilamani, (12) Akhyata-candrika, (13) Mathura-mahima, (14) Padyavali, (15) Nataka-candrika and (16) Laghu-bhagavatamrta. 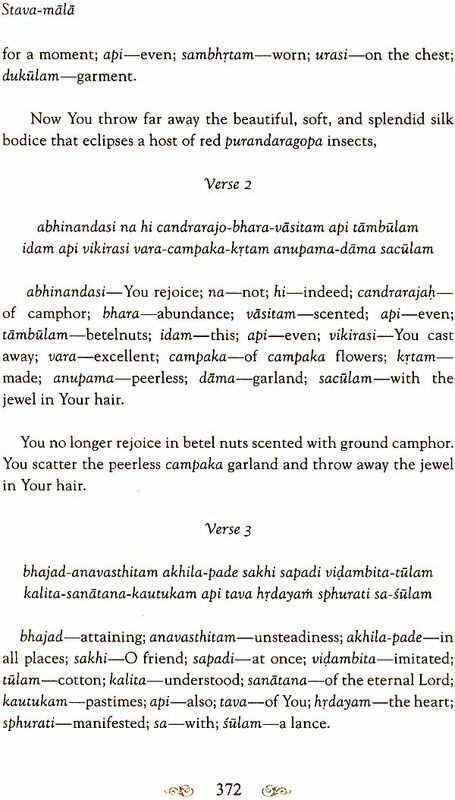 In his Sri Caitanya-caritamrta, the author, Srila Krsnadasa Kaviraja Gosvami, has mentioned many verses from the Stava-mala. One example is Madhya 13.206. 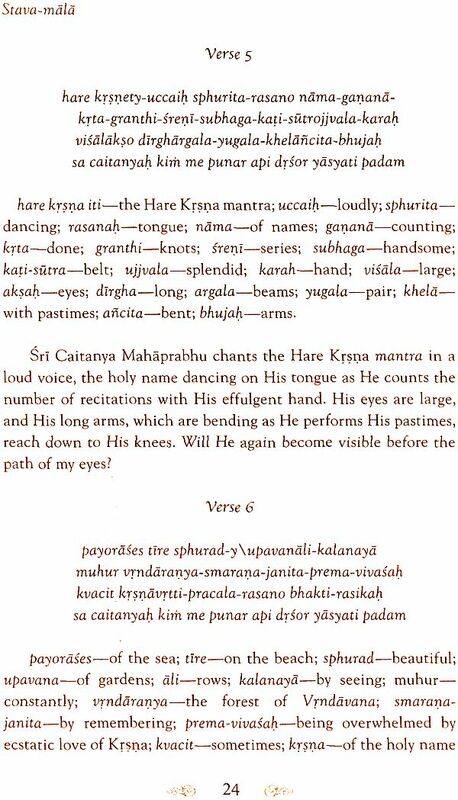 "In his prayer known as the Caitanyastaka, Srila Rupa Gosvami has given a vivid description of the Lord's dancing before the car of Jagannatha." ) which are included in the book Stava-mala." 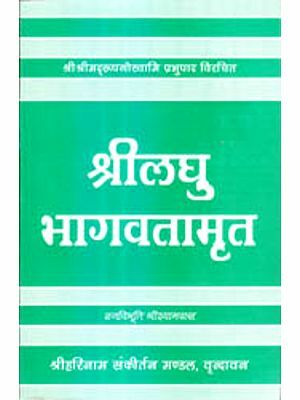 I am interested to buy also the complete works of the Ramayana, Mahabarata and Bhagavad Gita.